Others are looking at what you have to offer. Be proud of the work you have done and the effort you’ve made to highlight the details. It’s the little things that will mean the most. Don’t cut corners, don’t look for the short cuts. Take your time and allow your determination to achieve your goals shine through you and inspire others. You’ve been discovered, now it’s time to allow the word of mouth to get around to the right people. Be patient. Represent the essence of Enterprise & Inaction, Inspiration & Pessimism, Distinction & Disregard. Make today one of Enterprise, Inspiration and set yourself apart from the usual negative sensationalized rhetoric with your own distinction. You have the inspirational energy to lift up those around you and make it possible for healing to begin. Use your bright heart and soul to bring light into the shadows. Shed your energy on the negative and you will be able to turn it around not only for yourself, but for those who are hurting as well. While everyone else is being hateful, negative, pre-judging and trying to stir up the fires, you can be the one who brings cool to the situations. There’s enough spin in the news, on TV and in your own network of acquaintances, friends and family. You don’t need to add to it, but you do have the energy to squelch it. Or at the very least, help to ease the pain it causes. You can be the four winds that brings in the positive change. By working calmly, with a focus on the little things, you’ll be the one who finds the holes and fills them with positive energy. Don’t worry about others who are tossing mud and trying to start something that keeps everyone in the dark and walking down the wrong path. Let their karma create their own consequences. You don’t have to do anything about those individuals, except wait. Their thoughts, words and actions will rise up and haunt them for a long time to come. For what you put out, you will get back. All you need to worry about is how you share your energy to bring about peace, calmness and healing. 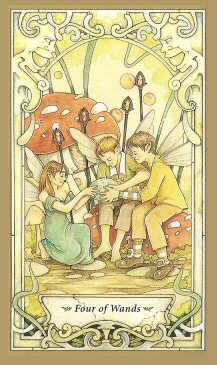 The magik of wands will help you spread your energy to all four corners of the world. But only if you’re patient and take your time to create the details behind your ideas and plans. Be the inspiration that others seek. Allow your work to be set above the rest with distinction. Your enterprising efforts will provide as needed. The only hard part is sticking with the silver lining and not allowing the negative to turn your visions into inaction. Do that and you will be able to right the injustices, build the bridges and help the wounded to heal and rise up once again.